Sweet potatoes always add color and sweetness to a meal. 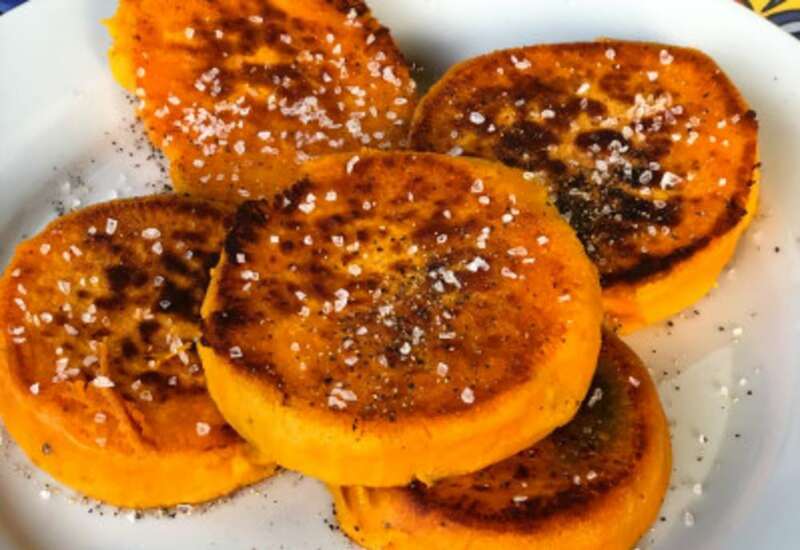 This recipe for sweet potato medallions is so quick and easy you will be making it all the time. They make a great appetizer for Sunday dinner, a side dish for Thanksgiving, a component to a veggie bowl with quinoa, beans, sautéed vegetables, and tofu, or simply eat them like a cookie! Prick sweet potatoes all over with a fork and place onto steamer rack. Lock pressure cooker lid in place and set steam vent to Sealing. Select Pressure Cook (Manual) and cook for 12 minutes on High Pressure. Let pressure release naturally. Carefully unlock and remove lid. Remove sweet potatoes from pressure cooker using tongs; place on cutting board and slice into 1/2-inch medallions. Peel skin from sweet potatoes. Melt ghee in a skillet over medium-high heat. Place medallions into hot ghee and cook each side until browned, 2 to 3 minutes per side. Season with salt. Try sprinkling different seasonings on the sweet potatoes before cooking in the skillet. Rosemary and fresh garlic are nice for Thanksgiving. Cumin and cayenne make a spiced earthy flavor. Try caramelizing onions while the sweet potatoes are cooking in the pressure cooker; add the sweet potatoes to the skillet with the caramelized onions and cook until browned. Or top the browned sweet potatoes with brown sugar and cinnamon for a dessert version! Per Serving: 171 calories; 7g fat; 26.8g carbohydrates; 2g protein; 16mg cholesterol; 139mg sodium. I started a paleo diet with my girlfriend and this was one of the first recipes we tried. The sweet potatoes cooked so fast in the pressure cooker. Only thing I wish to change to this recipe is searing the medallions in ghee in the actual pot of the pressure cooker instead of a separate skillet. I'm sure I could have done it this way, but I didn't try. Next time I will because I've seared other foods in my pressure cooker before with equal results. I love sweet potato medallions. I would usually buy the frozen ones and roast in the oven. This version made in my pressure cooker was really easy and very good. I can definitely taste the difference from using fresh sweet potatoes. I top mine with brown sugar instead of salt and pepper. Perfect side dish for fall! The skin peels right off so you don't have to worry about peeling beforehand. This is hands down the easiest way to make sweet potatoes. Wow...what a fun way to serve sweet potatoes! I used ras el hanout seasoning (means "top shelf", and it is! It's Moroccan Spice you can make!) and seasoned both sides of the medallions before browning them. I didn't have ghee on hand so I used a Butternut Seed olive oil. Absolutely delicious!